Death Cab for Cutie’s rise from small-time solo project to emotive, Grammy-nominated rock quartet is one of indie rock’s greatest success stories. Launched in the bayside college town of Bellingham, WA, the group was originally a side project for singer/guitarist Ben Gibbard, an engineering student at Western Washington University who split his time between school and music. Taking a break from his local power pop band, Pinwheel, Gibbard began recording an album’s worth of solo material in the summer of 1997. Producer Chris Walla lent his help to the recording sessions, which soon produced an eight-song cassette entitled You Can Play These Songs with Chords. When the tape proved to be a local hit, Gibbard reached into his circle of friends to assemble a band, hoping to play the new songs live. 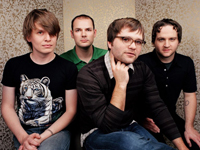 Bassist Nick Harmer (Gibbard’s roommate) and drummer Nathan Good quickly climbed aboard, while Walla enlisted as the band’s primary guitarist (he would also go on to produce most of the band’s future releases). With a lineup now in place, Gibbard’s group rechristened itself Death Cab for Cutie (named after a song by the Bonzo Dog Doo Dah Band) and signed a contract with the Seattle-based Barsuk Records within a year’s time. The quartet made its studio debut with 1998′s Something About Airplanes, an album that featured several re-recorded tracks from the You Can Play These Songs with Chords cassette as well as a dreamy, pop-oriented sound reminiscent of Built to Spill. Although both Gibbard and Walla continued to pursue their own projects (including Gibbard’s successful stint with the Postal Service), Death Cab for Cutie continued to rise in popularity, and the follow-up effort We Have the Facts and We’re Voting Yes was issued in 2000. Nathan Good exited the group just prior to the album’s completion, and We Have the Facts introduced Michael Schorr as Death Cab’s new drummer. The Forbidden Love EP arrived that same year, while a third full-length effort, The Photo Album, was released in 2001. By this time, a sizable audience had gathered around the band’s emotional music, and Barsuk re-released You Can Play These Songs with Chords in 2002 with ten additional songs. The polished, hook-laden Transatlanticism arrived the following year and announced the arrival of drummer Jason McGerr, who had previously played in a band with Nick Harmer before Death Cab’s formation.